Item #MD-1: Lot of one hundred, 3-4" long, assorted natural colors, Mexican Onyx standing Donkeys. Item #MD-1: 3-4" long, assorted natural colors, Mexican Onyx standing Donkey. Item #MD-1: Lot of twelve, 3-4" long, assorted natural colors, Mexican Onyx standing Donkeys. Item #MD-1: Lot of one hundred, 3-4" tall, assorted natural colors, Mexican Onyx Sitting Donkeys. Item #MD-1: Lot of twelve, 3-4" tall, assorted natural colors, Mexican Onyx Sitting Donkeys. 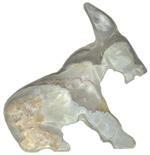 Item #MD-1: 3-4" tall, assorted natural colors, Mexican Onyx Sitting Donkey.